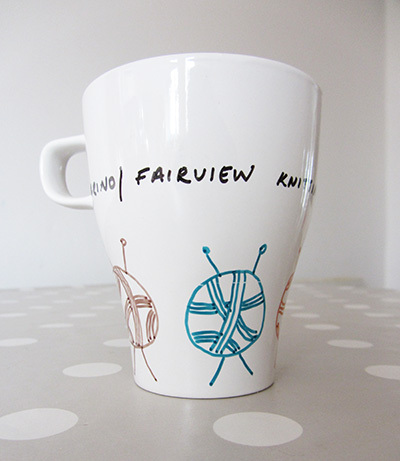 Last Wednesday was the first public meeting of the Marino/Fairview Knitting and Crochet Circle. It turned out to be a success as 28 knitters and crocheters showed up that evening! Some of the crafters in attendance were seasonned knitters, others were just beginning but all got something out of the evening. There was tea, biscuits, chats and skill sharing, the all thing in a very friendly and relaxed atmosphere. To sum it up: exactly what it was meant to be. Organisation was spotless thanks to The Busy Mama: there were all type of tea and coffee you could dream of, countless home made biscuits, lovely table clothes and even (hand) decorated mugs and glasses (look at the picture above, pretty nice huh?). We meet every second Wednesday of the month so if you want to join us in March, here is what it is: a volunteer run knitting and crochet group where you bring along a project you’re working on or would like to start. If you’re stuck just shout: there has to be someone here able to help.